In my day job I have the pleasure of working with tons of companies, and one of the neater ones is Funko. 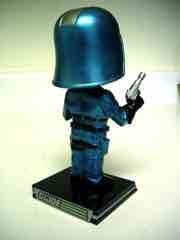 They do mostly bobble heads, including this Funko G.I. 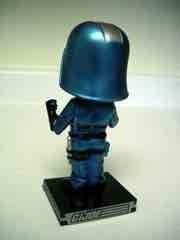 Joe Metallic Cobra Commander bobble head. Funko makes a number of Comic-Con exclusive repaints in the low hundreds, often in the same packaging as the normal release with a sticker identifying this one as different-- if the metallic paint weren't enough, of course. This bobble head is a straight-up repaint of the normal release. Notable details include the silver stripe down the top of his helmet, a laser pistol, and the shiniest of the shiny metallic paints used to make the body pop. 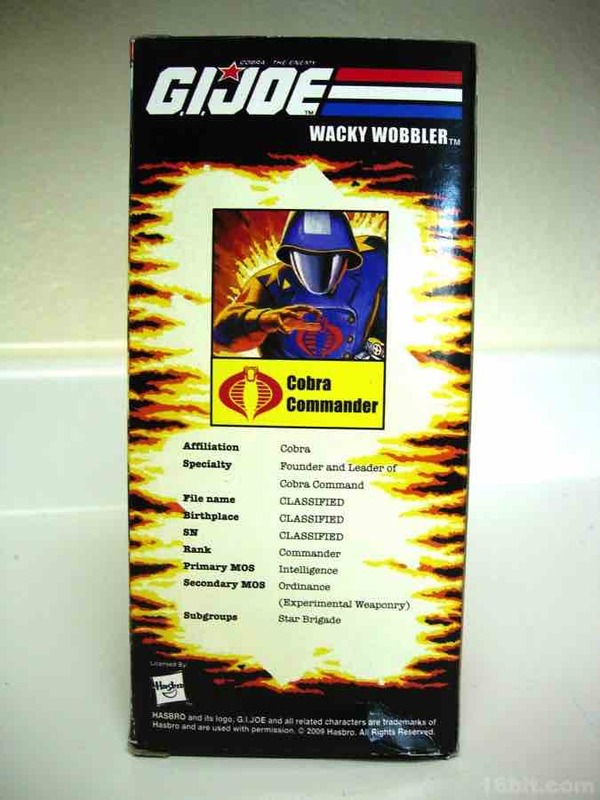 Depending on your tastes it may be a little gaudy, but it does stand out on a shelf nicely and after tons of flat blue Hasbro action figures, this one really does stand out as different. Standing about 7-inches tall, these bobbles are a significantly cheaper form of figural collectible than the beloved action figure, and Funko has picked up a number of licenses that simply do not get action figures made of them. 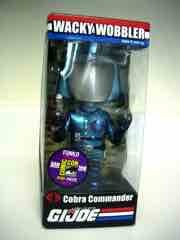 Cobra Commander is, of course, no stranger to the toy aisle and his personalized display base makes it obvious who this is, even if you don't have a clue what it is that you're looking at. 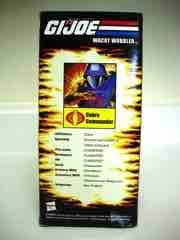 With no articulation and no accessories, what you see is effectively what you get-- there's not much "toy" here but this kind of thing seems tailor-made to buy people to stick on their computers or next to the phone. 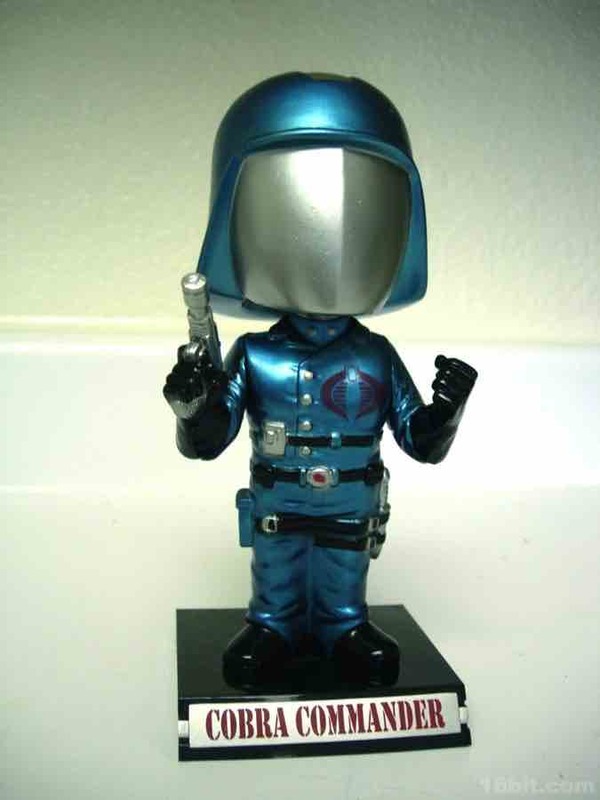 Clearly more for collectors than anybody, it's a neat, limited piece of Joe-dom that you probably overlooked... but hey, it happens to the best of us.